Fourth Row Center: Film Writings by Jason Bailey: In Theaters: "A Film Unfinished"
The film was found in a concrete vault, hidden in a forest in East Berlin. The cans were labeled Das Ghetto. The propaganda film inside them, shot in the Warsaw Ghetto in the spring of 1942, was never completed—until now. Israeli filmmaker Yael Hersonski’s A Film Unfinished is part historical document, part cinematic mystery; she shows the film in its entirety (or close to it), and meticulously reconstructs the circumstances surrounding the shoot, from diaries, reports, and eyewitness accounts. It is a fascinating, difficult, essential film—both as a Holocaust documentary, and as an examination of the very nature of propaganda. 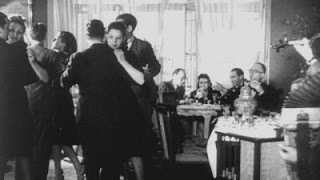 The footage that the Nazi crew shot alternated between horrifyingly real street scenes in the tiny ghetto (a half million Jews were trapped within its walls) and scenes of supposed Jewish aristocrats, enjoying fine wine and food while their countrymen suffered and died, their corpses left in the street. Those scenes of aristocracy were staged, of course, with residents (“actors” seems too voluntary a word) forced to make believe for the camera that they were living the high life. Hersonksi approaches this harrowing footage clinically; Ishai Adar’s brilliant score is used sparingly and effectively. More often than not, the scenes are played in silence (the original film was abandoned before a soundtrack was assembled), or with the quiet hum of the projector its only accompaniment. In examining the mystery of the film—who made it? For what specific purpose? Why was it left incomplete?—Hersonski uses diaries, journals, and financial reports, which often describe the staging of events as we seem them play out on-screen. A reel of outtakes shed further light on exactly how even throwaway moments were staged; late in the film, color footage, shot behind the scenes by a visiting cameraman, shows the crew creating a key sequence. Survivors of the ghetto, children at the time, are seen watching the scenes, overwhelmed. “Oy, I remember that woman,” says one. “The piles of garbage are real,” notes another. One question that A Film Unfinished poses, but is never quite able to answer, is what the film was trying to accomplish. To show contrasts? “There were many contrasts in the ghetto,” one survivor says. About our only clue is the notion that the film would “let the world see the paradise the Jews are living in,” but about the best explanation we can come up with for the film’s abandonment is that, for all of the staged “contrasts,” the real life that the cameras captured was too disturbing even for a propaganda film. Nothing they could stage could offset the horrors of what surrounded them. And even in those scenes the Nazis created, the faces of their unwilling casts betray them. Those faces, you can’t get them out of your head. Late in the film, we see a sequence in which a group of men and a group of women are forced to take a “ritual bath” for the camera; it is a stomach-turning sequence, humiliation and cruelty on a level difficult to even comprehend*.The corpses on the sidewalk, the real ones, are gathered to be hauled away to a mass grave, but we see multiple takes of them being removed—have to get that just right, y’know. At the grave, their emaciated bodies, just skin and bones, are slid down and stacked up. The cameras roll. We watch, and wince. In the hands of Hersonski (and editor Joel Alexis), the images are slowed, isolated, examined. The circumstances are explained, the moments frozen. The effect of this film’s manipulation—the slowing, the scoring, the narrating, the analysis—is devastating; it’s as if, through that manipulation, they’ve transformed the Nazi’s fiction back into fact. The overall effect of A Film Unfinished is overwhelming; towards the end, in that sequence that shows the piling of the bodies, one of the survivors shields her eyes. “Today I cannot watch this,” she says. “Today, I am human. Today, I can cry.” We know how she feels. "A Film Unfinished" opens today in limited release.